In this post, we took a look at 5 popular grass seed brands. This seed is spread on lawns to grow grass. There are many advantages to maintaining a lawn, including: the reduction of soil erosion and the filtration of groundwater (Source). There are many ways to spread and plant grass seed, but the common way is to use a spreader and to work the soil with a garden tool before spreading the seed to prepare it. While it’s easy to get bogged down in all the “rules” and tips for planting grass seed, most experts say the main things to remember are to plant your seed at the right time of the year, which varies from region to region, and to choose the right type of seed for your climate (Source). Here, we look at five popular brands of seed. Jonathan Green Black Beauty Ultra is a 7 lb. bag that provides up to 2,800 sq. ft. of coverage. This seed produces plants that have a waxy coating that helps to keep disease away and preserves moisture in the plant. This grass is ideal for those who live in dry climates or climates that experience drought. Pennington Smart Seed, Sun & Shade comes in a 3 lb. bag and produces a dark green/blue plant that’s versatile and thrives in sunny as well as moderately shady conditions. Also, like the previous, this seed also produces a plant that’s resistant to drought. Scotts Turf Builder heat tolerant mix comes in a 7 lb. 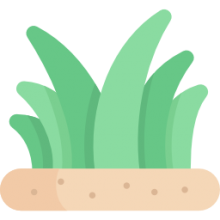 bag and grows a thick, green plant that’s guaranteed to be thicker than traditional grass. This plant is also ideal to hot, dry conditions as it recovers quickly from drought and spreads quickly to repair damaged areas. Lastly, this features Scotts’ WaterSmart PLUS coating, which helps the plant retain moisture, and protect it from disease. 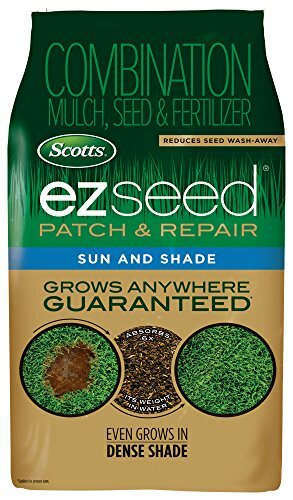 Scotts EZ Seed Sun Shade comes in a 10 lb. bag and is designed to grow virtually anywhere. The formula allows it to grow in high traffic areas, sunny, and shady areas as well. If you’re looking for a seed that’s easy to get going under a multitude of conditions, this is a good buy (Source). Last up is the Scotts Turf Builder Sun and Shade mix 3 lb. bag. Note: This item is not sold in Louisiana. This mixture is designed to grow quicker than other grasses and to come in thick and lush. Like the previous mix, this one also uses Scotts’ WaterSmart PLUS coating to absorb more water and to retain the vital nutrients. Also, if you’re looking for a seed that’ll grow in a variety of conditions, this one is a good choice. It grows quickly and spreads to cover bare spots. It’s one of the most versatile seeds we looked at and a good buy. Users love how beautiful their yards look, but some do note that they are disappointed with the result. The Scotts mix grass seeds are wrapped in a unique coating, which absorbs more water than ordinary seeds, feeds, and protect it from diseases. It’s perfect for both for yards with dense shade or sunny spots, and it grows in 5-10 days, but it may take up to two months until you have a beautiful lawn to impress your neighbors. In general, buyers have a favorable opinion of these seeds, and they are satisfied with the quality of the product. A reviewer comments that he saw the first signs of sprouting ten days after he used the mix and that after a month he could barely recognize his lawn. Another user also observes that you’ll have a lush lawn if you water it right and prepare the soil for planting. He adds that he would gladly buy it again. A purchaser also mentions that you don’t have to worry about overseeding due to the blue coating which makes it visible. However, a couple of customers have complained that they followed Scotts’ instructions to the letter and there were no sprouts at all despite sufficient watering. If you are wondering how to grow a beautiful lawn, you might try these EZ grass seeds offered by Scotts. Users love the easy application process, but some do note that they are not happy with the result. Scotts’ sun and shade seed package is available in four sizes – 3.75, 10, 20, 40 LB, and it features a new and improved formula to reduce wash-away. What’s more, it’s perfect for sunny, shaded, or high traffic spots, because it absorbs 6x its weight in water. The seed will grow anywhere as long as you follow the directions on the package. 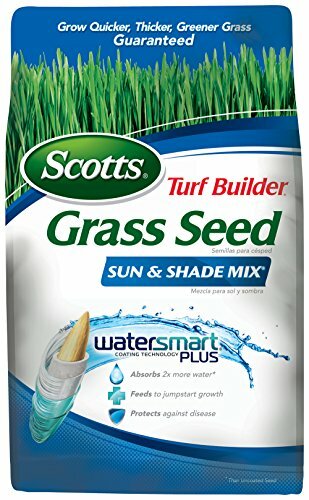 As a whole, users have a mix opinion of the Scotts sun and shade seeds, and they are complaining that it doesn’t work well. An unhappy buyer mentions that he saw no sprouts even though he followed the instructions to the letter. He adds that he watered his yard every day and there was no new growth even after six months. Another user states that a lot of the sprouts died in a month and the ones that survived were thin and weak. On the other hand, a happy purchaser shares that he saw the first signs of new growth after two weeks and that he is very pleased with the result. Another one comments that he used the package on a stop damaged by his dogs and the fescue came out strong and lush. 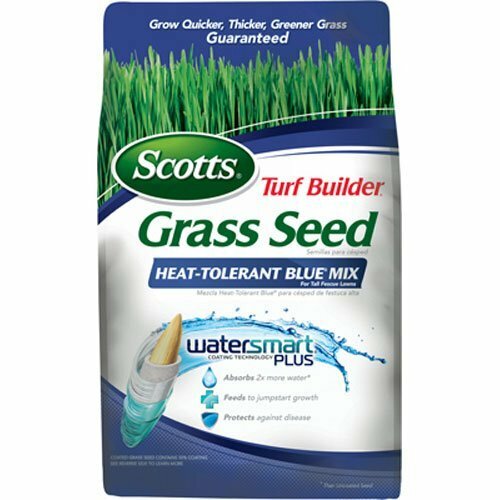 This blue grass seed mix offered by Scotts is an excellent choice for damaged yards, lawns exposed to scorching heat or shady places. Users love the Scotts’ formula, but some do note that the seeds are slow to germinate. The Scotts heat tolerant mix features Water Smart coating, which absorbs 2x water, feeds essential nutrients, and protects the seeding from diseases. Another great thing about this product is that the fescue grows 33% thicker than an ordinary one. What’s more, it recovers quickly from heat/drought and will spread to repair any damage. The package is available in three sizes – 3, 7, and 20 pounds. In general, users have a negative opinion of the Scotts heat-tolerant seeds, and they are disappointed with their purchase. A reviewer mentions that he followed the instructions, watered the grass daily, and after two weeks there was not a sprout in sight. He adds that he couldn’t get a refund and he doesn’t recommend the product. Another purchaser states that only 25% of the seeds grew and that he saw results after two months of constant watering. A buyer also mentions that the package seems past its expiration date to him and that the results were awful. On the other hand, a happy customer observes that he has been using Scotts mix on his lawn for almost years and that the grass always grows fast. If you’re wondering how to have a beautiful, green lawn despite the hot weather, you might try this smart seed offered by Pennington. Users love the varieties of seeds included in the mix, but some do note that the grass is not as thick as they expected. The Pennington sun & shade mix has excellent drought tolerance in addition to disease and insect resistant. It features special MYCO advantage and Penkote technology to produce a thick dark blue-green lawn. What’s more, the sprouts will need 30% less water than an ordinary one. A package can cover up to 1,000 square feet. A reviewer mentions that he planted the mix in Florida and that he saw the first sprouts after a few days. He adds that the grass is growing beautifully and that it’s strong, thick, and lush. Another buyer states that the dark green fescue looks amazing as long as you keeping watering the soil. The user also mentions that he highly recommends as the best smart seeds available. However, a couple of customers have noted that they followed the instructions provided by the manufacturer and nothing happened. A few also point out that it grows in spots and that Pennington doesn’t honor their guarantee. 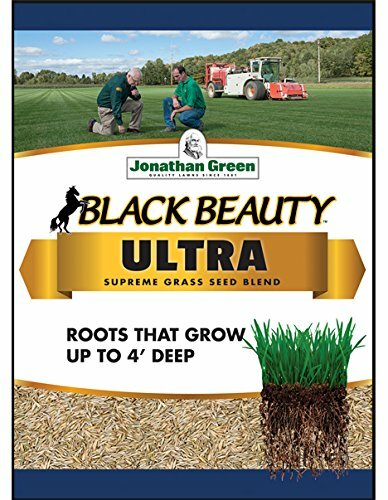 This black beauty grass seed offered by Jonathan Green is heat resistant, germinates quickly, and it’s an excellent choice for different climates. Users love the diversity of the mix, but some do note that it’s expensive. The Jonathan green grass has an invisible coating, which is great because it wards off diseases and keeps moisture sealed in the leaves, so it’s perfect for dry areas. What’s more, it’s designed to produce a dark-green, uniform lawn, which would be naturally insect-resistant. The product is available in packages of 1, 3, 7, and 25 pounds, and a 7-pound bag can cover up to 2,800 square feet. A purchaser shares that he is very happy with the way his lawn looks and that he loves the rich green color. He adds that everything germinated quicker than he initially expected and that he highly recommends it. Another buyer states that he has been using Jonathan Green’s products for years and that he has one of the lushest lawn in the neighborhood. A reviewer also mentions that the grass recovers quickly in spring and that it thrives well in sunny and shades spots. However, a few customers have complained that the fescue germinates too slowly and that there are bare spots. A couple also notes that they watered the lawn as instructed and nothing grew up. If you live in an apartment, green grass is just but a backdrop of your daily life. But when you set foot in the suburbs, strange thoughts start flowing through your mind. In the suburban world, grass is given much importance, and you are consumed by its mysteries, and hence you find yourself questioning, why your neighbor's zoysia grass glow green like a golf course while yours is a brown mess crowded by weeds? What constitutes perfect grass? How Bermuda grass seeds work and their germination is somewhat of a mystery that no one can answer. You get one chance to sow it but wait for weeks to see if you did the right thing. This article tries to answer the mystery behind grass seed germination and how to best plant it. The germination process kicks off once the (Pennington brand) seed absorbs sufficient moisture and the process is regulated by soil temperature depending on the variety. The seeds’ outer casing can at times delay the germination process until the conditions are favorable. For germination to happen below requirements must be met. Favorable temperatures should be present for grass seed germination to take place. Warm season grass will require 55-65 degrees while cool season grass will require 45-55 degrees. It’s important to note that soil temperatures are often colder than air temperatures. Sufficient moisture must be present throughout the entire germination process. Too much moisture can result in seed rot while too little will cause the seed to dry out. Some gardeners invest in handsome rain barrels for moisture control and to make their yard more attractive. Given that a grass seed has limited resources to support growth while below the ground, a sprout must break through the surface to allow photosynthesis to take place. Sprouts will fail to reach the ground surface if the seed is buried too deep. When the sprout finally breaks through the seed, oxygen is required to initiate the sprout growth process. When the soil becomes saturated with water, oxygen becomes limited thus limiting sprout growth. Compacted soils are highly attributed to this problem. Planting grass is a simple task and not as difficult as many might think- in fact, it’s an activity that can be done successfully by anyone. Below are simple steps for best results. The raw materials always influence the final product, and a beautiful law can only be grown from the best grass seeds. Buy seeds that have been evaluated and rated. Buying approved seeds means that they have been bred for best green color and that they are also insect and drought resistance. The starting cost might be high but what you get as the final product in your lawn is worth every penny. If you’re planting new lawn –loosen 2-3 inches of the soil and remove debris from the selected area. Avoid too fine soil but break soil clumps bigger than a half dollar. Level the ground to avoid water collecting on parts of the lawn and avoid the use of weed killers before and after planting the seed. For existing lawns, cut the grass as short as possible and lose a quarter inch of soil in areas with no grass. Remove dead plants and debris and level areas where water might collect. For small lawns, spread the seeds evens by hand, but for larger areas use a mechanical seeder or a lawn spreader. Plant about sixteen seeds per square inch because too many seeds in one area will result in competition for nutrients by seedlings. Cover the grass seed bed with about ¼ inch soil to retain moisture and hold seed together. To enhance germination, keep the seedbed moist, water lightly and never saturate the seedbed. When is the right time plant? For best results, it’s important to best to plant in the spring and fall. Don’t apply weed control chemicals to the grass if you’re planning a spring planting. Apply when the seed has germinated and have mowed at least three times. Before you dive in, let us know in the comments section if you want some grass seed tutorials regrading purchasing it from Lowes, Home Depot, Tractor Supply, Agway, Walmart, Costco; using a spreader; using it with a spray; temperature calculations, especially with snow; and blanket, roll and mat types. In the event that your yard is beginning to appear thin or exhausted, if it has bare places or if it is not nearly as drought or weed proof as it was previously, it could be time to over seed. Over seeding entails applying grass seed over a preexisting lawn to make It more voluminous and fuller- this is an essential portion of an excellent all round lawn care system. Early fall is a perfect season for over seeding in many areas of the nation, although spring may also work. The video shares some pointers for over seeding success to guarantee great results the project. There's a few items you want to check before you decide to sow the grass seed. Something to bear in mind is that if you have not too long ago used a weed control or prevention product on your property, you may want to wait a certain period of time prior to over seeding, therefore stick to the guidelines on the packaging. One more thing to examine before over seeding is the quantity of thatch buildup on the lawn- thatch is the coating of dead grass and other organic material over the soil. Having some thatch is common and advantageous, but having greater than about .5 inches can hinder your yard's health far too much fats may also negatively impact over seeding efforts. If the thatch layer is not much more than a half inch thick, and it is not all that hard to push through with your finger aerating the lawn, which the video creator talks about more in depth in the video, may be enough to break it up. If you've got a really heavy layer of thatch or if it's difficult to get through, you might want to take it off with a dethatching rake or a bow rake or with a power dethatcher before continuing further. If that's the case, mow the lawn and gather the clippings first. Additionally, remember that dethatching can be hard on grass, particularly if you make use of a machine. Therefore it is vital that you time it properly. You don't need to do it during a drought or a heat wave, for instance. Yet another thing you might want to do before you decide to over seed is aerate your lawn. For those who have done it recently, raking breaks up compacted soil and helps air water and nutrients penetrate and enables the facilitatitation of strong root development. It may also help with breaking up thatch. As the creator discusses, periodic aerating might help enhance the well being of fully developed lawns and aerating before you decide to over seed is a excellent way to assist grass seeds to settle in and get off to a good start.